Vinegar & Water De-Icer — Does this really work?! Although I am absolutely so excited about finally getting some snow…. my truck windshield and windows are now completely covered with ice! 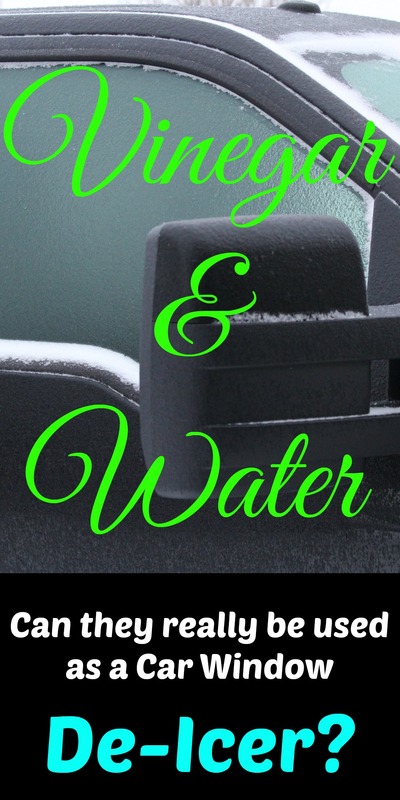 Every year, I see and read tons of blogs and blips about mixing water and vinegar to use as a car window de-icer…. and every year I think “Hey — What a great idea… I must try this!”…. And every year, I never do…. Until now! Just about every recipe using vinegar and water that I read, called for about 1 part water and 3 parts vinegar. So, I found myself a nifty spray bottle and started mixing. I then took a beautiful “before” picture of my truck window, and then started a-spraying! I then started waiting…. and waiting…. and waiting. Nothing happened! If anything, the sprayed mixture just created another layer of ice on my window… Eek! Thanks to my simple little experiment, I can now safely tell you not to waste your time, it does not work! However, that being said, further research indicates that vinegar may be used to prevent ice build up, but whether or not this actually works, I cannot say. If you have tried this and had a different outcome, please let me know! And for more tips & tricks on keeping your windows ice-free, check this awesome Creek Line House post out: Handy tips to de-ice your car and windshield! Christmas Home Tour – Part II – The Great Out-Doors! Ahh… Welcome to the great-outdoors — Of my front yard, that is! When we moved into our cozy, dream-home, one of the things that I was so excited about, was the pretty front porch that I would get to decorate! Since decorating a ginormous front porch can get a little costly, I tried to use items that I already had, plus lots of greenery from the back yard. I made my very own Cedar Boughs with some wire and pliers. I then made these super-easy, 2-Minute Bows, from only one roll of geo-mesh for $10. To dress up the area around the front doors, I made very, very simple Christmas urns. I used my cheap summer flower pots, but spray-painted them all a metallic-black color to make them match. Next I stuck boughs of Spruce into the pots, and then tied very simple mini-version-bows onto the boughs. Last night when I was about to do my photo shoot, I realized that I didn’t have a wreath for my door — a major faux-pas! So in house-coat, high-heels (because they were the closest shoes to me??! ), I dug out the ladder to find my old Christmas wreath…. It wasn’t anywhere! Panic-Alert!!!! So after running around trying to come up with something else to use, I found this cute, little, tin-bucket and stuck some old garland and branches of cedar in it. Whew — Crisis averted! Matt, (my husband), was in charge of the Christmas lights, and I must say, he did a fabulous job! Below is my big, beautiful, grape-vine wreath that my wonderful mother made for our wedding! It’s about 5 feet in diameter, and I absolutely love it! 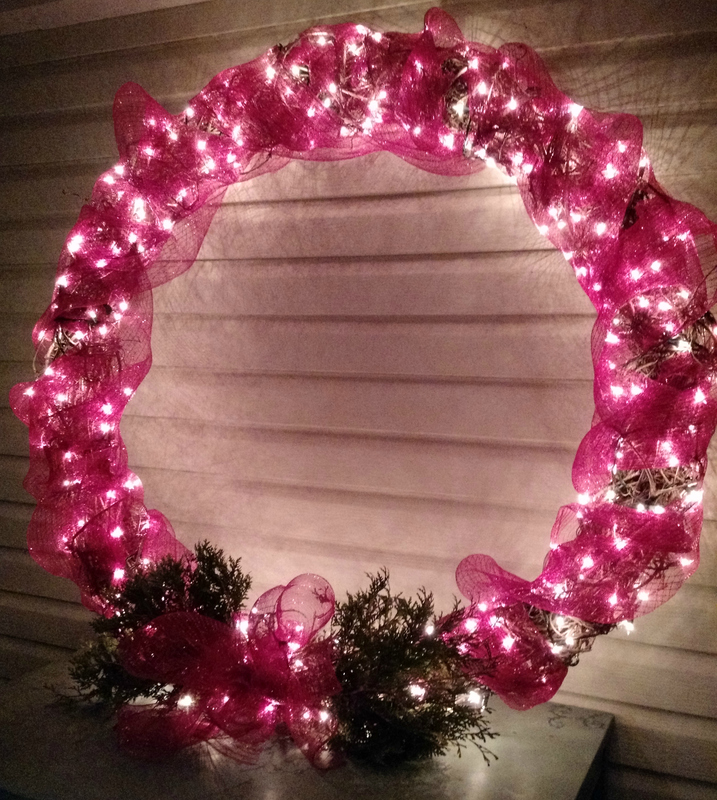 All I did to “Christmas-Up” my wreath was add some lights to it, wrap it in red geo-mesh, and add a matching cedar bough and bow to it. It’s so sparkly and pretty… definitely my favorite piece of holiday decor, this year! Total cost for this front porch Christmas decor, $21.00!!!! $10.00 on geo-mesh, and $11.00 on spray paint…. Now, all we need is some snow!!!!!! !